You must be here because you’re interested to learn about the DockATot loungers. If so, you’re in the right place! In this read, I’m going to inform you on everything I know about this product through my own experience and give you an authentic, real consumer DockATot review. I am an owner of both versions of the DockATot and yes, I purchased them both on my dime, this post is not sponsored. This review is genuinely coming from a place of wanting to give other parents a knowledgeable heads-up before they too decide whether this co-sleeper is worth investing in. I would only ever take the time to write a review about a product I myself, have used and tested. In fact, this is the first product review I have ever written! 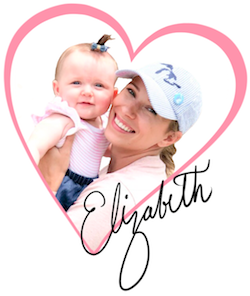 The reason I chose to write a review on the DockATot in particular, is because of how much of an impact it has made on me as a first time mom. A good or bad impact you may ask? Well, you’ll have to read the review to find out! The views and opinions stated in this review are my own and are not a direct representation of DockATot. As you can see my little one loves to get into “happy baby” pose in her dock. The DockATot docks come in two different versions, the DockATot Deluxe+ and the DockATot Grand. The difference between the two are the size. The Deluxe+ is designed for infants 0-8 months old and the grand is more suitable for babies and toddlers up to 36 months. I never thought I would be a co-sleeping mom, but the DockATot completely changed my mind! The comfort of having my newborn inches away from me all night, gave me a peace worth every penny it cost to own one of these co-sleepers. And see what this mom had to say about her deluxe+ dock. What makes the deluxe+ special? The Deluxe+ has been expertly crafted with the highest safety standards. It’s ideal for co-sleeping because of it’s unique rounded sides that create a barrier between baby and parent when used in an adult bed. The DockATot also has a womb-like shape, which gives your baby the ultimate nurturing comfort. Made with fabrics that create a micro-climate that will ensure no over-heating. Multiple uses in one item, the DockATot can be used for nesting, nursing, tummy time and more. Because of the great experience I had with the deluxe+ dock, it was an easy choice deciding to purchase the grand. My little one grew out of the deluxe+ by about 6 months (she’s in the 99% for height), but I knew I wanted to keep co-sleeping with the DockATot! Here’s another real mom’s review of the grand dock. For toddlers, the Grand dock helps to reduce nighttime waking interruptions because of the cozy and safe environment it provides. The Grand dock helps with crib to bed transition and the raised edges keep your toddler from rolling out of bed. This dock is a cozy “hang-out” lounge for toddlers to enjoy anytime and anywhere. The same micro-climate and high-tech fabric is used on the Grand, which means no harmful amounts of heat are harbored. Co-sleeping can be a wonderful experience for mom and baby. However, there does need to be a serious take on safety precautions when deciding to sleep in bed with your baby. I would recommend reading this safe co-sleeping guidelines article. The American Academy of Pediatrics has determined that the safest place for a baby to sleep during the first year of life is in a crib, bassinet or play yard in the parents’ bedroom. The DockATot Deluxe+ is intended for babies 0-8 months and is to be used for lounging, supervised napping and tummy time, co-sleeping, changing diapers, cuddling and playing. 1.) Never allow baby to sleep with an adult who suffers from sleep disorders, is under the influence of drugs or alcohol, or is obese. Ensure that each adult in the bed are fully aware of baby’s presence. 2.) Carefully prepare the bed. Place the dock on a firm mattress and be sure it lays flat and remains flat with adults in the bed. Position the dock in the center of the bed, near the headboard. Each side of the dock should be at least 12″ from the edge of the bed. Remove all extra pillows, blankets or anything else that could cover the baby’s head. Make sure there are no extra covers, pillows, shams, sheets etc. over the dock. Covers can end up over the baby’s head and cause over-heating. Parents should use separate covers to reduce the risk of blankets being pulled up over the baby. 3.) To reduce the risk of sudden infant death syndrome, place baby on back in dock. 4.) Do not add blankets, pillows or padding of any kind under baby in the dock. 5.) Keep all cords and strings away from baby. Cords of any kind can pose a strangulation risk. 6.) Never leave baby alone in an adult bed. 7.) Never use components of dock separately. Only use when fully assembled and zipped. Loose fabrics and parts may present a suffocation hazard. My little one all nestled in and dozing off. One of the best aspects of owning a DockATot, is the ability to take your baby’s bed anywhere you go! 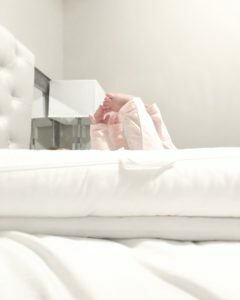 We have never had to worry about where the baby will sleep when we travel overnight or dread her not sleeping because she’s unfamiliar with her nighttime routine. She always has her cozy and nurturing dock with her for any overnight stay and she sleeps like a champ all of the time too! How do I travel with my dock? Transporting your dock is easy too with their stylish and water-resistant travel totes. You literally can take your docks anywhere, and some moms do too! They can go to the beach, to the park on a picnic or even to the pool. Believe it or not, but you can actually accessorize your DockATot! The toy arch attachment turns the Deluxe+ dock into a lounging play yard. How cool and comfortable is that?! Head over to their site now and check out how cute this toy arch is! We are going to dive even deeper into this review and discuss the details of caring for and cleaning your DockATot. How do I wash my DockATot? The process of cleaning your dock is very simple and fool-proof and here are the manufacturers recommendations. Machine wash warm in a garment bag. Do not bleach, dry clean or iron. Hang to dry directly after machine wash to help avoid color bleeding for covers with prints. Do not tumble dry. Hand wash and lay flat to dry. Do not tumble dry, iron, bleach or dry clean. Machine wash warm and hang to line dry. Do not tumble dry, iron, bleach or dry clean. The inner tube rarely needs washing. Shaking and ventilating are usually enough. View the replacement parts for yourself. She can safely lay in her dock anywhere and not roll out! When you receive your dock, it will be packaged in a large black box. Your DockATot will also come in a waterproof poly bag (keep this for future storage). Let me also give you a heads up about the cardboard insert that will be inside the base of the dock. Note: You will want to un-zip that segment and remove the cardboard before laying your baby in it, keep this cardboard for storing in the future. First Baby Wish List Items You’ll Want, but Don’t Necessarily Need? Can the DockATot be used for tummy time? Can I use my DockATot in a crib, bassinet or play yard? However, The Grand Dock can be used in a toddler bed or big kid-sized bed, once the child is at least nine months old, and then only placed at a height that allows the child to safely descend on his own. Can I carry my baby in the dock? No.It is not safe to carry your baby in the dock. While docks themselves are very portable, you must remove your baby before transporting dock, even for short distances. – DockATot Safety Guidelines. I have done my best to be as thorough as possible and write this review with nothing but integrity. Like I said in the beginning, I own this product and have used it, loved it and never regretted buying it. Honestly, I toyed with the idea of buying the DockATot at first and actually did buy two other less expensive co-sleepers. Once I decided to make the wise decision and buy the DockATot, the other sleeping products I bought were never used or needed, including her crib! Without a doubt, I highly urge any new parent to get this product. Out of every baby necessity I made sure to have, the DockATot has easily been the best baby essentials buy of them all! The opinions stated in this review are my own and are not a direct representation of DockATot. 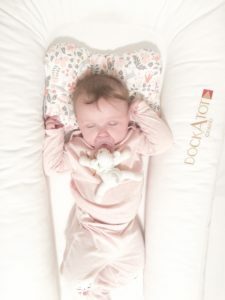 Did you get what you needed out of this DockATot review? If so, comment and let me know! Please follow my Pinterest account! Never miss out on new and informative content, get on the list with thousands of other parents who love their littles! Click this banner to get your hospital door sign!